Prosper Lending Review examined how Fynanz, a p2p lending site for student loans, quietly halted operations recently. In the article Tom points out that Fynanz attempts to market itself as a whitelabel service to credit unions and other financial institutions. Fynanz CEO Chirag Chaman is cited that the reason for no longer accepting new lenders and borrowers are market conditions with sinking interest rates. Chaman outlines the plans to cooperate with financial intstitutions/banks to finance student loans. Fynanz announced a lending bonus. Lenders can earn an additional 2%, if they refer at least 5 new lenders, which each lend 50 US$ minimum. In a recent "Tips for Borrowers" post, Fynanz says it added 700 more approved schools whose students may apply for a Fynanz loan. 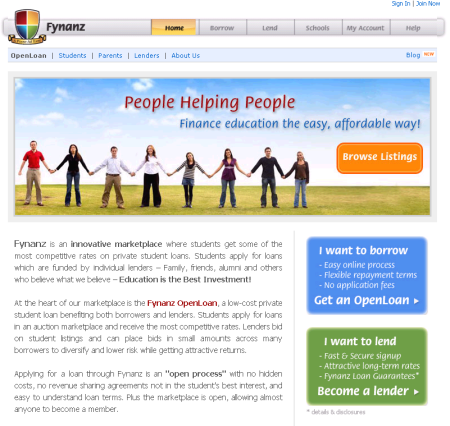 Fynanz.com, currently launching for borrowers in New York and Florida, offers peer to peer lending to students. The service differs from other p2p lending service in many points. The private student loans, also known as "alternative student loans", Fynanz offers have variable interest rates. Other p2p lending services so far operate only with fixed interest rates. At Fynanz interest rates are based on the LIBOR index, adjusted quarterly, plus a margin which is set by lenders. Suggested margins are 3 to 7.5% for a typical overall interest rate of 6 to 11% before fees. This is higher then federal student loans, but Fynanz still sees a large market, since federal student loans have borrowing limits and may not cover the entire costs of education. Very long loan terms of 10 to 20 years. Again unsual, but lenders may offer to sell loans after one year at a discount to Fynanz. There also seems to be the option to transfer a loan to a different lender (allowing the sale to a different lender). Students can select to defer interest payments while in school and for a 6 month grace period after leaving school. Loan amounts range from 2,500 to 20,000 US$ per loans. Borrowers may take out up to four loans per year to a total maximum of 160,000 US$. That is an unprecedented amount in p2p lending. Guarantee for lenders. Not only in case of identity theft, but also in cases of defaults Fynanz protects 50 to 100% (depending on FACS grade) of the loan amount. Fynanz applies it's own FACS grade (Fynanz Academic Credit Score) to rate borrowers. It not only relies on the credit history but also on academic charateristics. Pledge bids allow lenders to bid without having funds in account. Lenders must transfer money within 5 days of bidding. 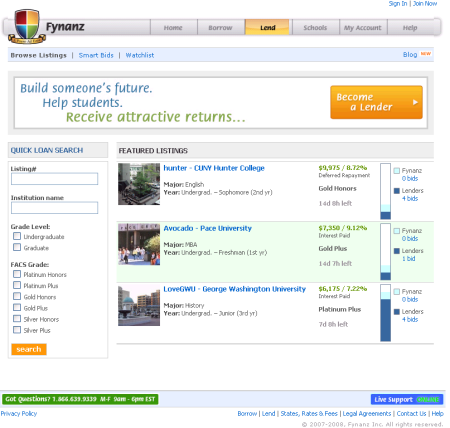 Fynanz has a "bid priority" that ranks four types of types of lenders in the following order: the highest priority lenders are friends and family of the borrower; then alumni of the borrower’s school; third are unaffiliated lenders; and fourth is Fynanz itself. Hollowoak has some more interesting points from the lender agreement in his blog, which Chirag Chaman, Fynanz CEO commented on. To browse listings go to the Fynanz listings page. Further information ressources include Tom's review, the comprehensive FAQ and the new Fynanz blog answering questions. Overall it will be interesting to see how Fynanz develops. If you use Fynanz as a lender or borrower please share you experiences in the forum.